This entry was posted on September 9, 2015 by Texas Safety Supply. The Moldex 2300N95 is favorite among factory workers due to its affordable price and high durability for n95 respirator protection. It's quality, comfort and ability to handle wear and tear are higher in comparison to other N95 masks. It’s outer shell is tough and will hold tough even in the most hot, humid climatic conditions. You won’t have to spend separately in replacement costs as you would do with other N95 mask brands. It comes with an exhalation valve which minimizes the build up of hot air and makes it easy for the user to breathe while performing his day to day tasks. This mask offers protection against 95% of nonoil airborne particles and is resistant to all types of wear and tear. It comes with a soft cushion and soft lining that makes it suitable to wear. This mask has been designed for use during a single shift by those who need respiratory protection. It has the well known Ventex valve that enables easy breathing and exhalation and lets air escape. So it is comfortable to wear. The adjustable hand strap allows users to let the respirator to hang around their neck when it is not in use. Other added benefits of this mask include affordable price and minimal replacement costs. The Moldex 2700N95 has a soft nose cushion that allows extended wear and greater comfort. The Dura Mesh shell has been designed to check collapsing while working under hot, humid conditions. 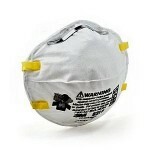 This N95 respirator has been designed to remove up to 95% of non-oil particulates. This model has the highest ASTM level of fluid resistance in the market. They also comply with CDC guidelines for prevention of TB that makes them suitable for use in hospitals and medical clinics. 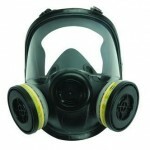 The molded nose bridge of the respirator comes with a soft foam cushion which ensures a good fit. These masks are latex free and have been manufactured with Dura-Mesh shell to resist collapse even under hot climatic conditions.